(*Original post updated 2018.) Here it is friends! 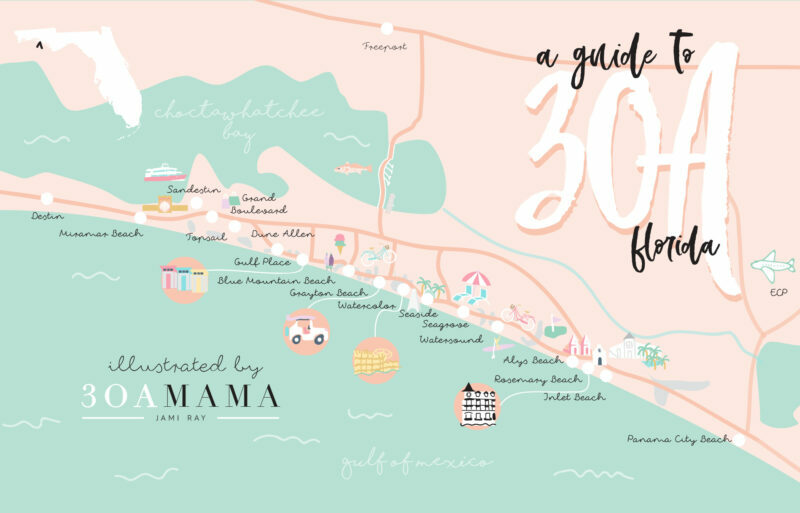 I’ve rounded up my favorite local 30A places to eat, play and stay and even designed a handy map just for you! 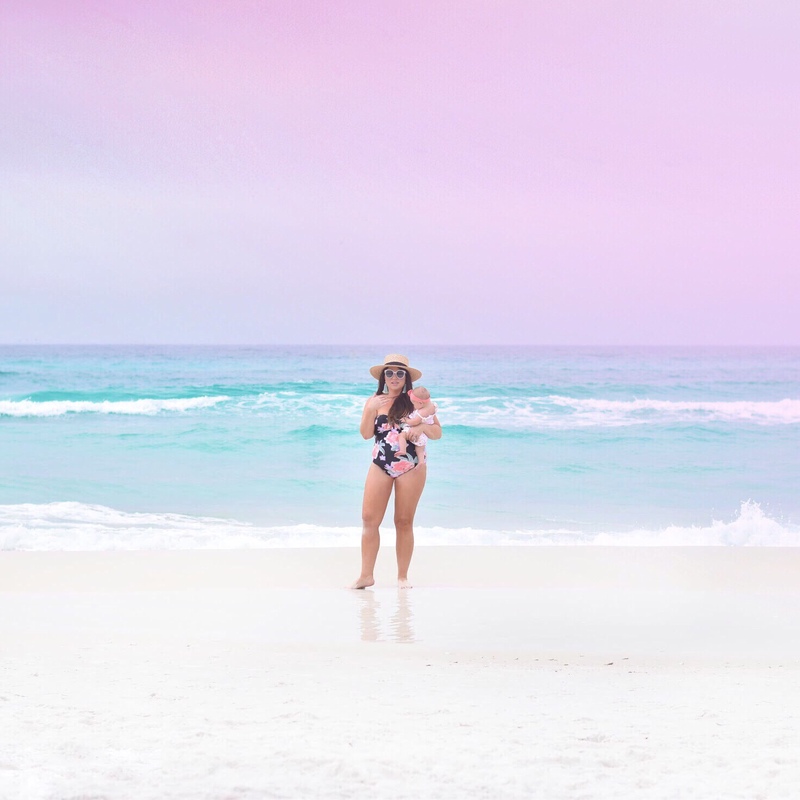 If you’re not familiar with 30A, this white sand, turquoise water paradise is made up of a string of chic neighborhoods that dot the coast between Destin and Panama City. 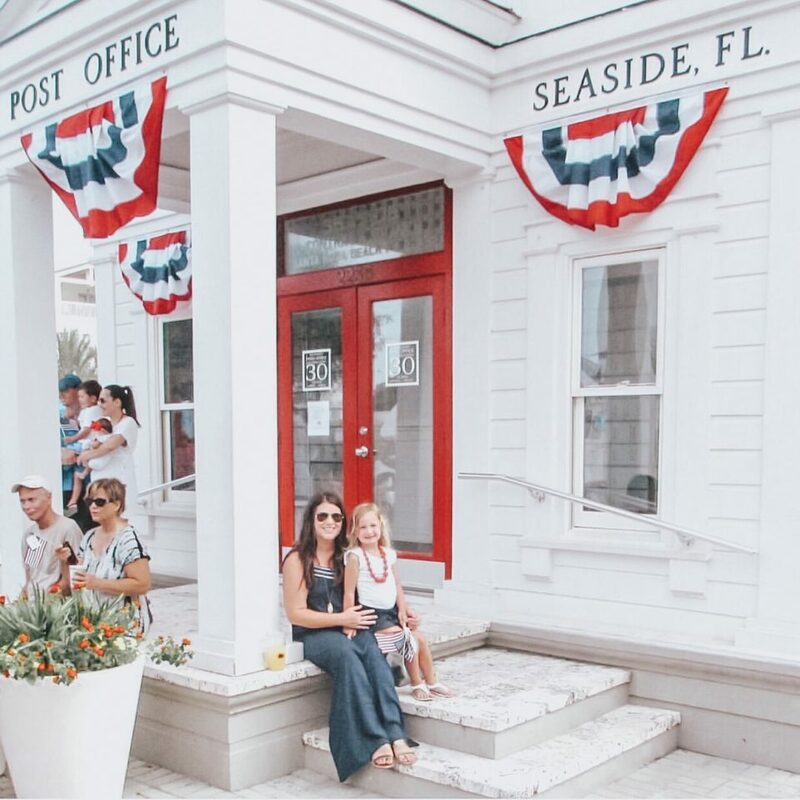 Places like Seaside, Alys Beach, Rosemary Beach, Watercolor and more make up our little beach towns with distinct architectural style, the most beautiful beaches and plenty of food and fun for everyone in the family. The Pointe This is a newer rental option located at “the point” of 30A in Inlet Beach. It’s within walking distance to Rosemary Beach, Alys Beach and shopping/dining at 30Avenue. They have a gorgeous pool, rooftop view and a delicious onsite restaurant (Big Bad Breakfast, see below). The Pearl This may be one of the most photographed hotels thanks to its sleek black and white aesthetic and swanky beachside vibe. 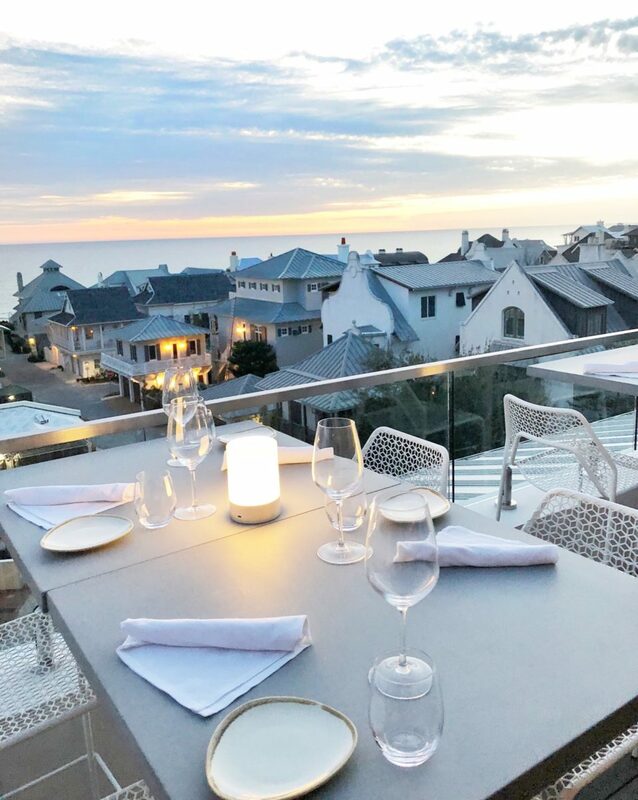 Located in Rosemary Beach on the corner of Main Street and Western Green, The Pearl is a true 30A gem with a beautiful location and amenities that include a delicious onsite restaurant (Havana Beach), cool rooftop bar and chic swimming pool. Important to note, however, that kids are not allowed in the pool so you might want to save this for a couples or girlfriend getaway. WaterColor Inn – Fun fact: I used to work at Watercolor every summer and was on the opening team the very first summer the resort opened before I left for college. 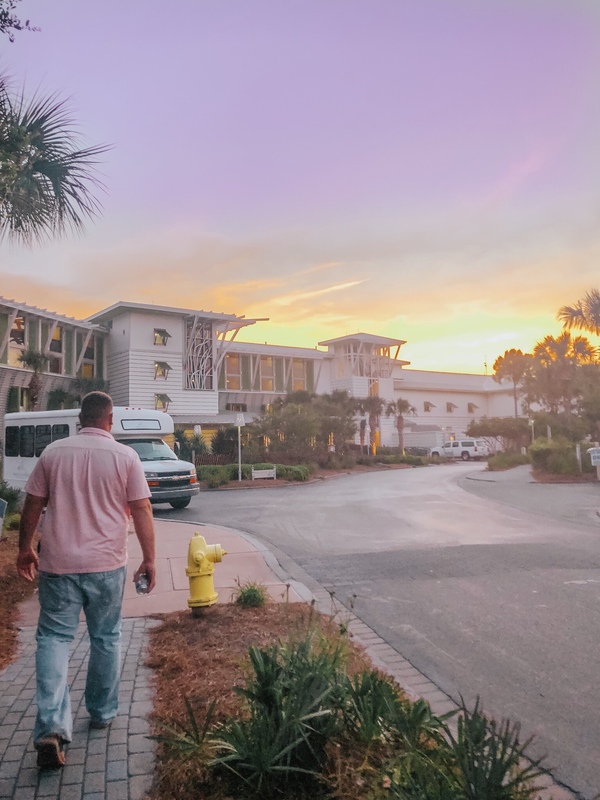 The WaterColor Inn is one of the other few hotel options on 30A and is home to The Gathering Spot and Fish Out of Water. For a full resort experience, I highly recommend it! 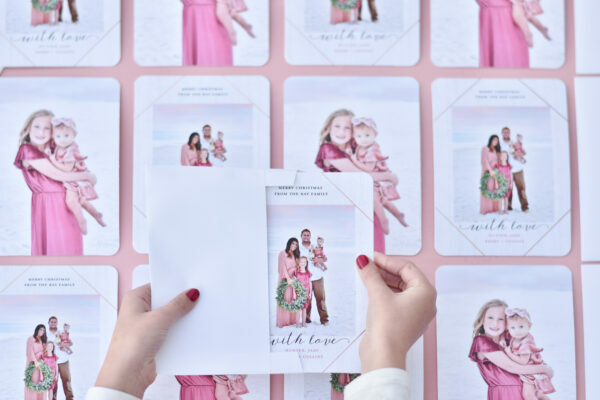 Live Well 30A I stayed in one of Live Well’s Gulf-front rentals during a fun 30A blogger weekend and loved being able to hang with everyone in a house that fit us so many. 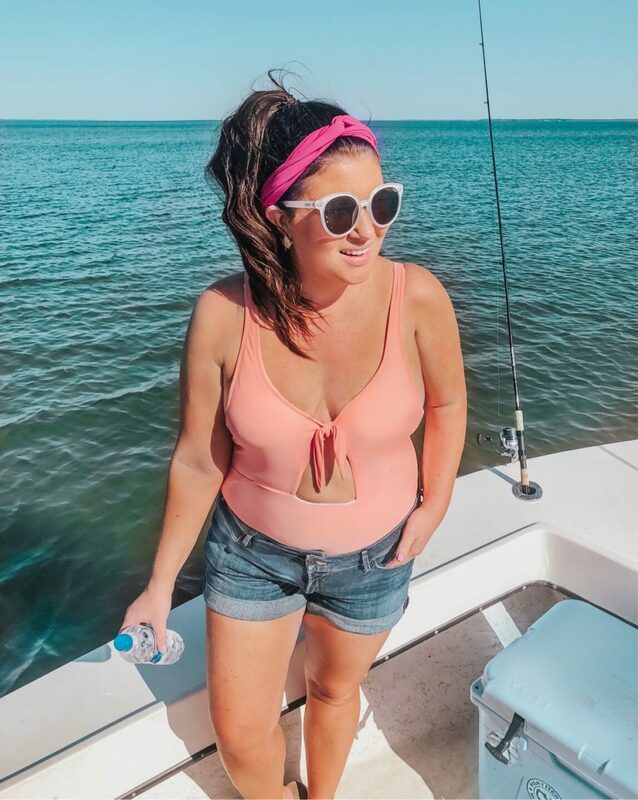 There are plenty of beach houses and cottages available to fit the size of your group, whether it’s a getaway for two or a multi-family shindig. A cute beach house! I also recommend Rosemary Beach Cottage Rental Company and Homeowners Collection for adorable cottages, bungalows and beach houses. Bud & Alley’s It’s hard to beat this view and Seaside’s Bud & Alley’s has been a longtime favorite (since 1986!) and is always a popular spot for dinner, but I also love it for lunch. The scenery is gorgeous and you don’t want to miss it in the dark. The tuna dip is delicious and Mo the bartender has never made a bad drink. My fave is the mojito but you really can’t go wrong. Chanticleer When I meet a girlfriend for lunch, we probably go to this Grayton Beach spot more than anywhere else! It’s a local secret (or once was!) and is tucked away in Grayton just north of 30A. 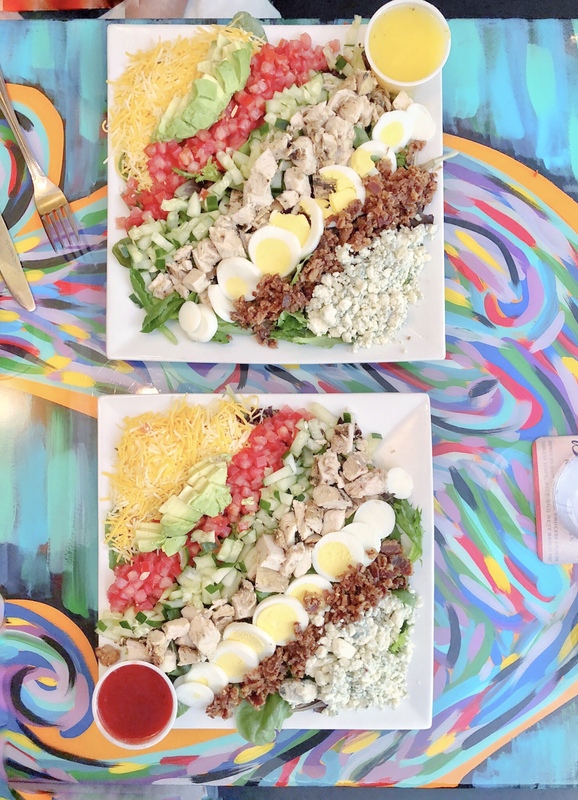 They’re giant salads are mouth-watering and overflowing with the best ingredients. The Cobb is my go-to, but I also love the Harvest Salad and the 1/2 and 1/2 with a sandwich. My best words of advice, however, are to save room for dessert. Order a cookie to go and when you get to the car, see how long you can last without devouring it. My record is 2 seconds. 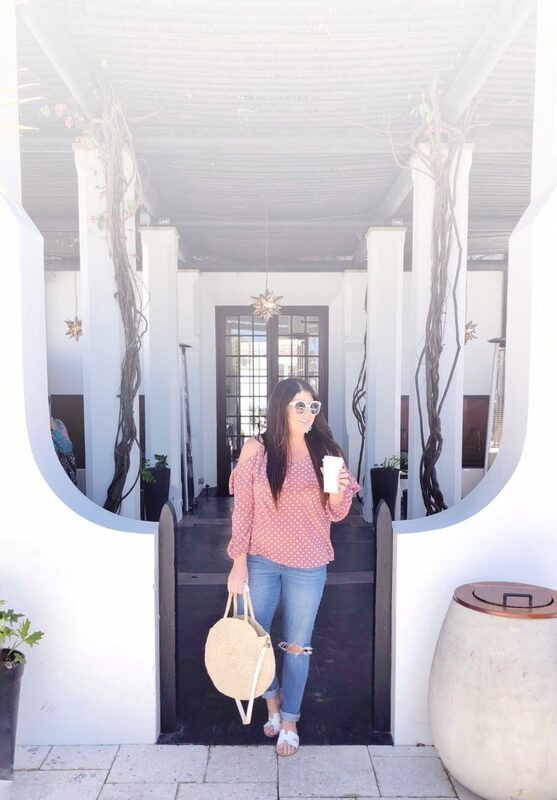 George’s Located in Alys Beach, George’s is the perfect patio lunch to enjoy with a glass of rosé on the side. Choose from the behave or misbehave menu, depending on your mood. Black Bear Bread Co Love avocado toast? Don’t miss this adorable spot, quickly becoming a king of tartines and fresh baked goodies. Yes, the avo version is delish, but my favorite is the banana tartine, perfectly topped with a hint of heat. 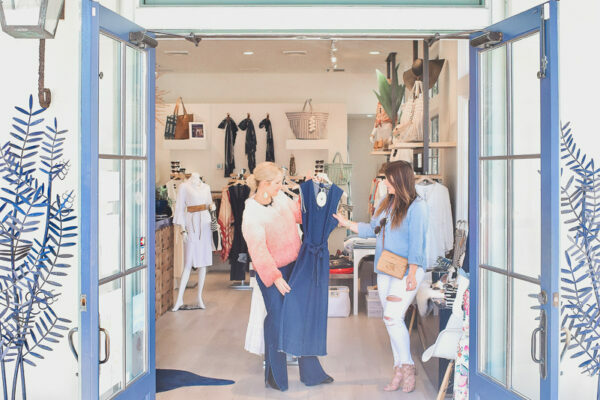 You can also find Stumptown coffee and endless Instagram worthy moments at this Grayton Beach spot styled in chic black and white. Chiringo The downstairs juice bar and outdoor bar are pretty cool, but I love sitting upstairs in this Grayton Beach eatery to see the Gulf. It’s usually open-air and gorgeous! 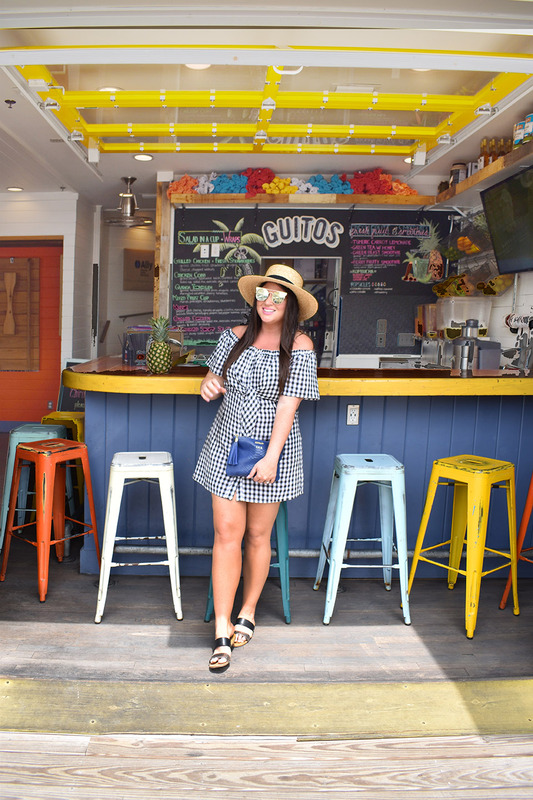 Try the Chiringo Bowl, snapper dip, shrimp tacos or the turmeric juice for a refreshing boost before the beach. Local Catch My husband and I have spent countless days and nights at this location over the years as it evolved through a series of restaurants, but Local Catch is the clear favorite with amazing tacos, yummy seafood and Hunter’s favorite, the Debris Sandwich. Be sure to say hi to my buddy Jimmy when you go! Raw & Juicy My friend Rebecca introduced me to the Costa Rican bowl and I haven’t looked back since. 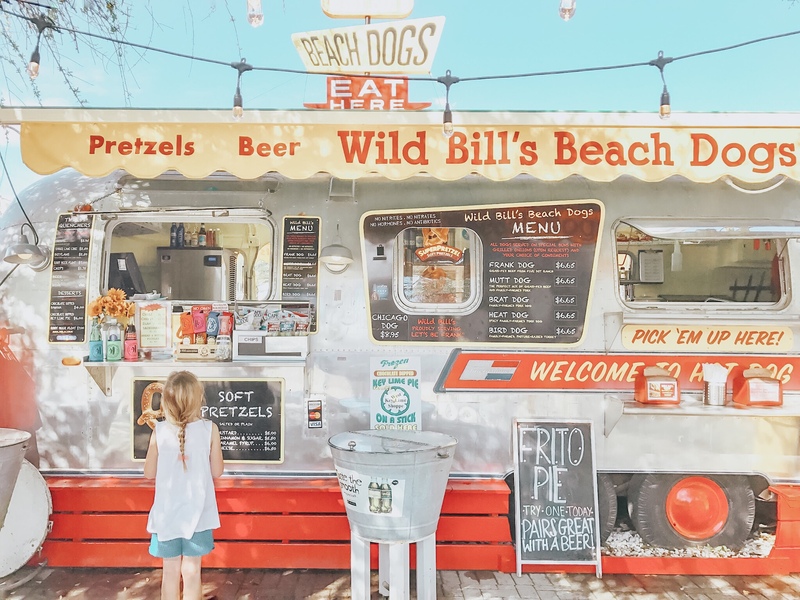 This Seaside airstream is known for great smoothies and juices, but don’t overlook them for lunch either. Crackings My friend Kristy and her hubby run this Grayton Beach spot and it’s the best for a delicious weekend breakfast or brunch. Along with a traditional eggs plate, Hunter and Emery usually split a pancake and I go for one of their specialty omelets. If you’re a coffee cup collector, don’t leave without one from here! Great Southern Beignets and mimosas? Yes, please! I love sitting outside at this Seaside spot to people watch and eat a full plate of Grits and Grillades or the Fried Green Tomato Benedict. Grayton Seafood Along with Nick’s on the Bay, Grayton Seafood is one of a short list of places my hubby will go to specifically for seafood. This little spot is laid-back and quaint, with delicious coastal dishes from shrimp to oysters and more. Try their craft beer selection, too! Donut Hole With locations in Inlet Beach and Santa Rosa Beach, this classic never disappoints. Run in for donuts or dine in for a traditional breakfast or lunch. The Bay This is hands-down our most visited restaurant around 30A because it has the ultimate parent-kid balance of great food and drinks for us plus old-school entertainment for the littles. There’s a small beach for kids to play in the sand while we wait for food or sip cocktails, complete with games like corn hole and giant Legos. Hunter almost always orders sushi or the Bay Burger and I usually go for the shrimp plate or the Jon the 2nd roll. It has fried tuna no top and is a beyond delicious. Pizza by the Sea If you’re visiting on a week day, Pizza by the Sea has the best lunch special with their pick 2 (slice, salad or soup) for $7.99 and has 4 locations so you can easily find one no matter where you are – Seacrest, Watercolor, Gulf Place and Sandestin. I usually go for the White Veggie and Spinach Salad or will get 2 slices and split with Emery. The atmosphere is usually loud enough to drown out any vocal kids or crying baby and there’s just something about their crushed ice I can’t get enough of. If you have room or want to promote good behavior for a reward, be sure to grab one of their giant chocolate chip cookies. Airstream Row The row of Airstream trailers in Seaside is always visibly crowded during the season with their mix of options including Barefoot BBQ, Frost Bites (sno cones), The Melt Down (grilled cheese), Wild Bill’s Hot Dogs, and Raw & Juicy (smoothies, salads, etc). It’s a great place for everyone in the family to grab exactly what they want in virtually one stop with a range of choices. We love the sliders at Barefoot BBQ along with the extra cheesy mac and cheese. Try the Turkey Avocado melt at The Melt Down, the Costa Rica Bowl at Raw & Juicy or pretty much any hot dog at Wild Bill’s. Find a spot to eat right there or take your food over to the amphitheater or the beach for more of a picnic feel. Cowgirl Kitchen This one is a 30A classic with delicious tacos and southwest salads, plus a brunch menu I could eat everything on. It’s super laid-back so always an easy one to enjoy with kids. They’ll love the Mac n Cheese! The Hub With multiple food options surrounding a large green / play area and big screen TV, the Hub is a great place to corral the kids while you eat or settle in for a movie or concert night. 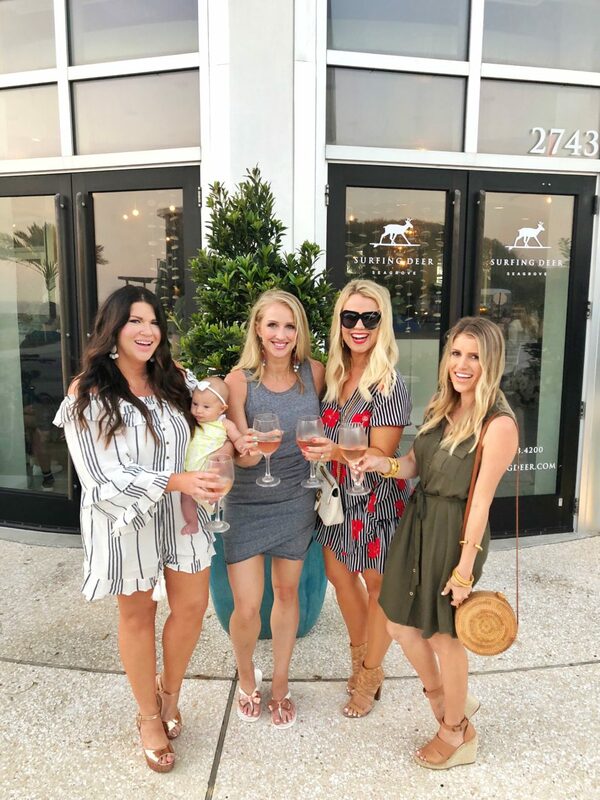 723 Whiskey Bravo Located in Seagrove just east of the 3-way stop, Whiskey Bravo is an upscale restaurant and rooftop bar with a chic monochromatic vibe, a picture perfect rooftop setting and delicious dishes to keep coming back for. (The owners are passionate about flying and named the brand after their plane call sign 723WB.) Hunter almost always orders the Niman Ranch Pork Chop while I love the Shrimp and Grits. Try one of the specialty cocktails during Happy Hour or snag a firepit table for your crew on the roof. Surfing Deer You haven’t lived til you’ve devoured the clothesline bacon. Or for that matter, the pimiento cheese hand pies. Yum! 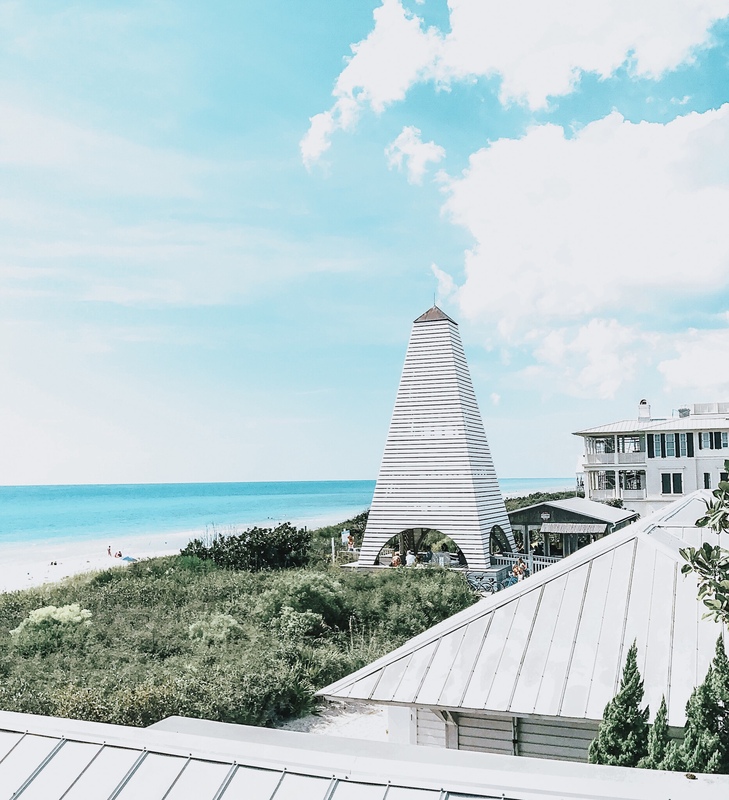 Located on the corner of 395 and 30A in Seagrove, Surfing Deer is an upscale spot where everything on the menu makes your mouth water. I have devoured Chef Gregg’s Famous Crab Cakes as well as the Havana Grouper – both delicious. 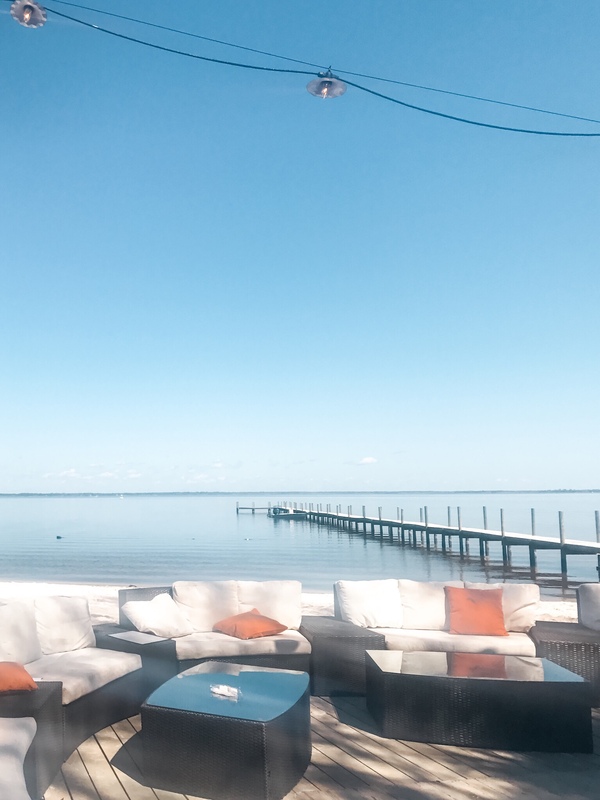 Arrive early for a drink at the bar and for a perfect 30A people watching perch, request a table on the patio. Surfing Deer even offers blankets if you feel the need to snuggle in! La Crema From chocolate covered bacon to the tastiest fondue, this is a fun tapas style restaurant where every bite is delicious. We also love to stop here at the end of the night just for dessert! Pescado This swanky rooftop restaurant offers amazing views of Rosemary Beach and the Gulf, but also has a fabulous menu with offerings you won’t find anywhere else. 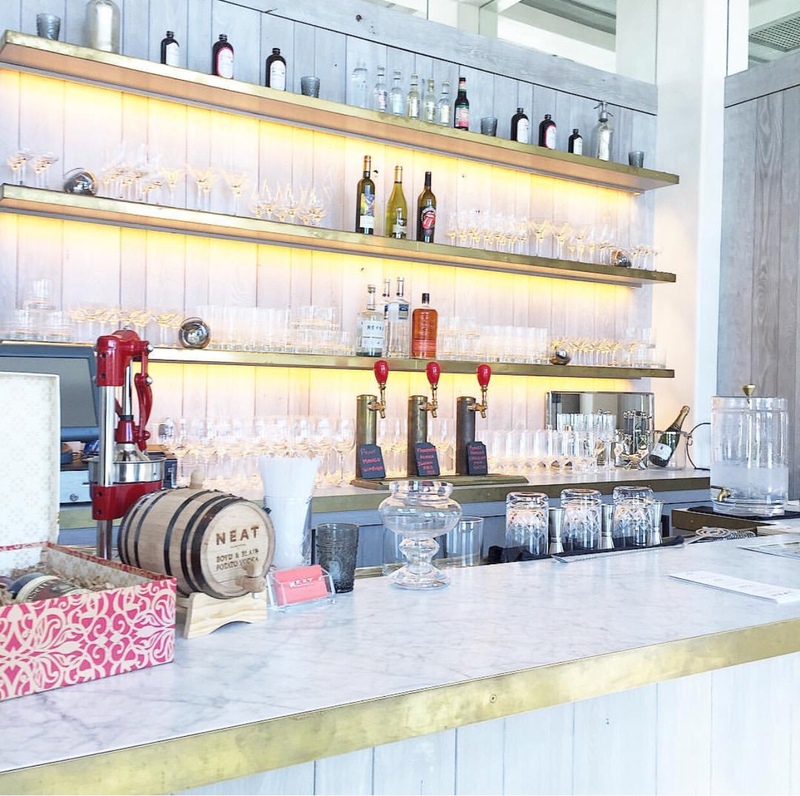 With crafted cocktails, a raw bar and seafood focused items, it’s a great spot for chic dinner out or a place to linger for sunset and a glass of rosé. I loved the seafood salad and if you appreciate red meat, spinalis is one dish not to miss. Neat Bottle Shop Craft cocktails and a picture perfect Alys Beach setting make this a fun first stop on our date nights. The offerings vary each time and never disappoint. What this tiny shop lacks in size, it more than makes up for in style and taste. Café 30A Another fun fact here: I worked as a food garnisher here one summer during college and it was one of my favorite jobs ever. (I may not be great at cooking, but I can legit garnish some food!) 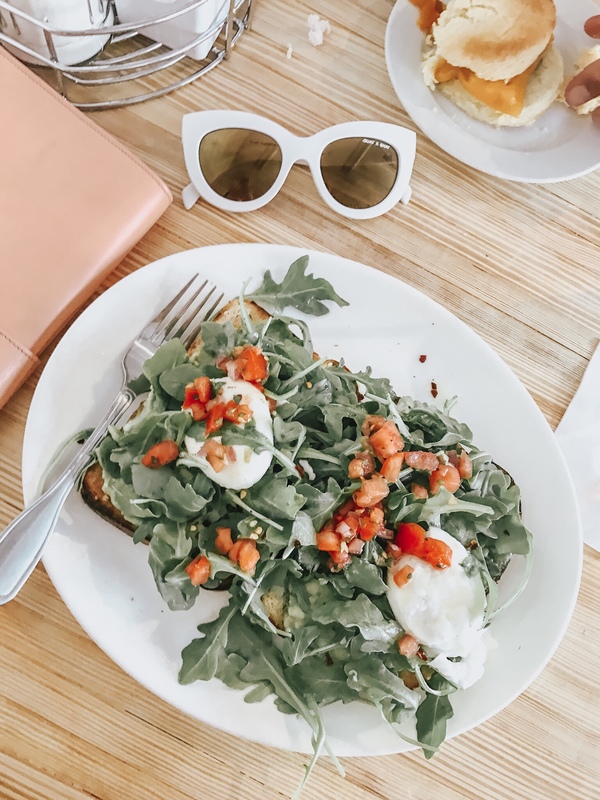 Known for their martinis and creative dishes, this Seagrove staple is one you have to add to any 30A dining bucket list. Paradis Located in Rosemary Beach, this chic spot is always perfectly dim for a total date night vibe with delicious cocktails at the bar. Sometimes we start here before dinner and sometimes we spend the whole evening here! Anything Lindsey makes at the bar is going to be a winner. 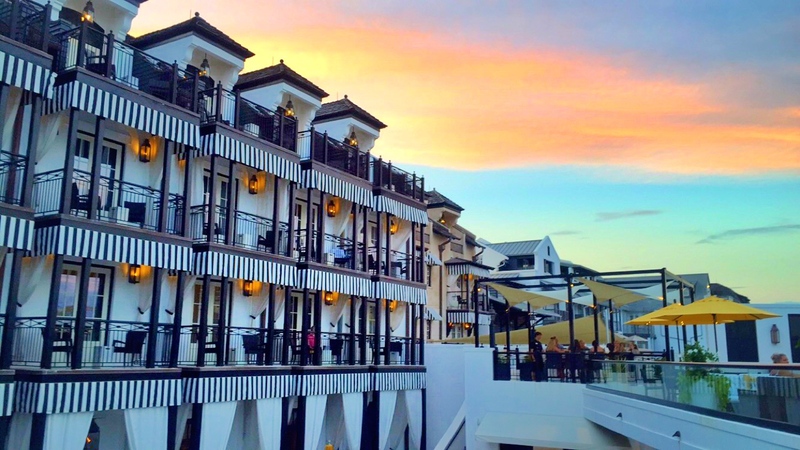 Caliza This is the ultimate poolside dining experience with its chic Alys Beach setting and impeccable dishes. Havana Beach Located inside The Pearl Rosemary Beach, we love to go here for drinks on the roof or downstairs but also love dinner here. Hunter always orders an Old-Fashioned, which is fun to watch being made and I go for the Hemingway Daiquiri. Outpost This 30Avenue shop has its own coffee bar and it’s the cutest thing you’ve ever seen. I love to sit outside and sip a flat white paired with avocado toast or grab an iced latte to go. 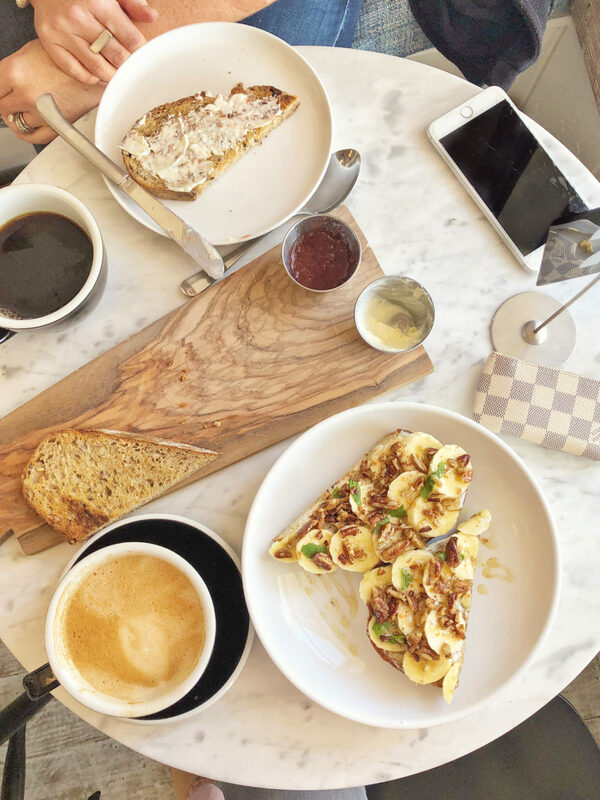 Fonville Press Frozen coffee and almond croissant, please! 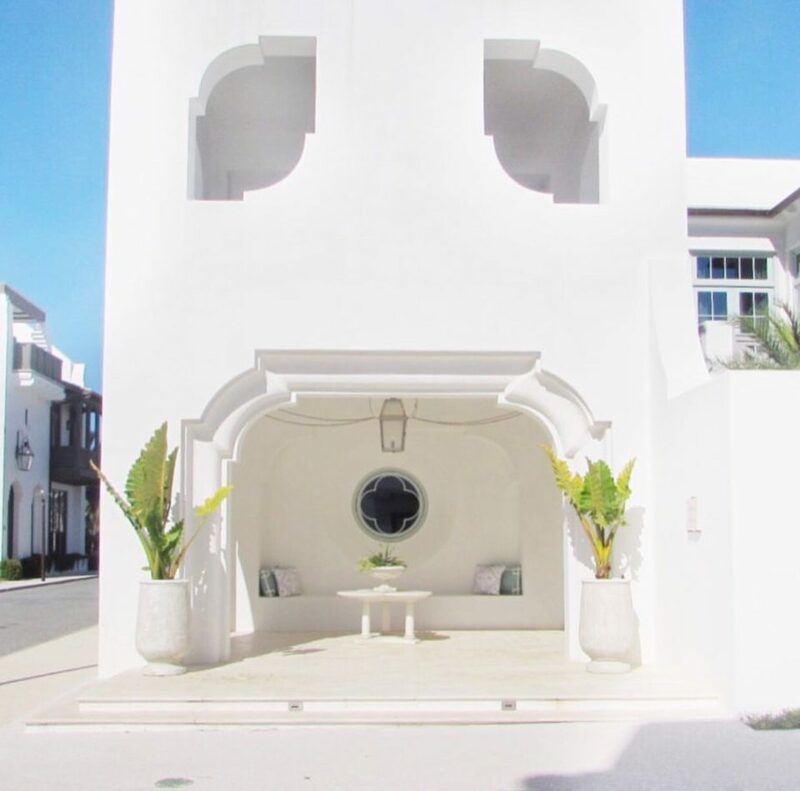 This adorably chic spot in Alys Beach is the kind of place you can sit in and stay awhile if you have work to do or a book to read, as well as a great place for the kids to play. The playground is pretty fab. 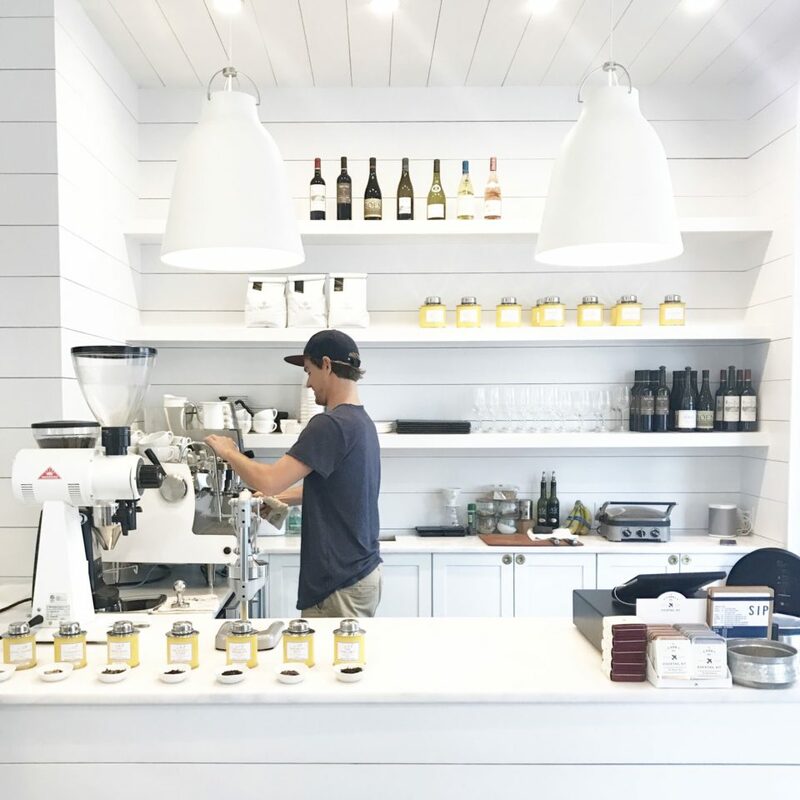 Amavida With locations in Seaside and Rosemary Beach, this go-to spot is great for a matcha latte, frozen coffee or any of their specialty brews. Their bakery items are pretty irresistible and I’ve been known to scarf a ham and cheese croissant a time or two. Black Bear Bread Co A perfect spot to start the day with a coffee and that delicious banana tartine I mentioned above. Heavenly For Emery, it’s birthday cake with sprinkles every time. And for a fun photo op, don’t miss the giant ice cream cone out front! Frost Bites You haven’t had a sno-cone until you’ve had one from Frost Bites in Seaside. These oversize treats remind me of my childhood and all things fun. Yes, you may end up with stained blue lips or “tiger’s blood” on your shirt, but it’s so worth it! Blue Mountain Beach Creamery Everything at the Blue Mountain Beach spot is handmade and the smell of baking waffle cones is enough for any dieter to jump ship. 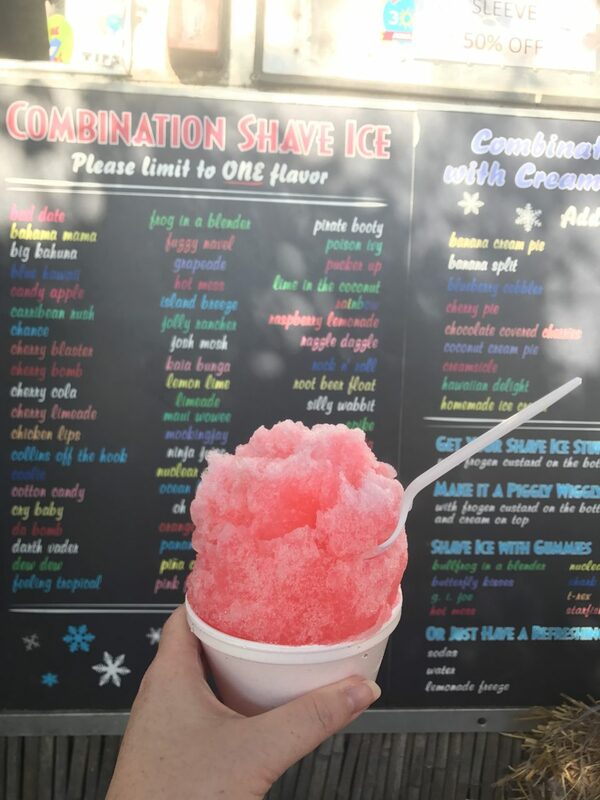 I love the sorbets, but you really can’t go wrong with anything. Sugar Shak This Rosemary Beach store is a candy lover’s dream. With seemingly every treat imaginable from vintage candies to trendy treats, ice cream, fudge and even edible insects, you have to stop in at least once to see what it’s all about. La Loba’s Bakery Now this one is my personal favorite and it’s a good day when my hubby brings home a surprise cheesecake brownie from La Loba’s in Blue Mountain Beach. This small bakery has healthy and allergy friendly options, too! Looking for donuts? 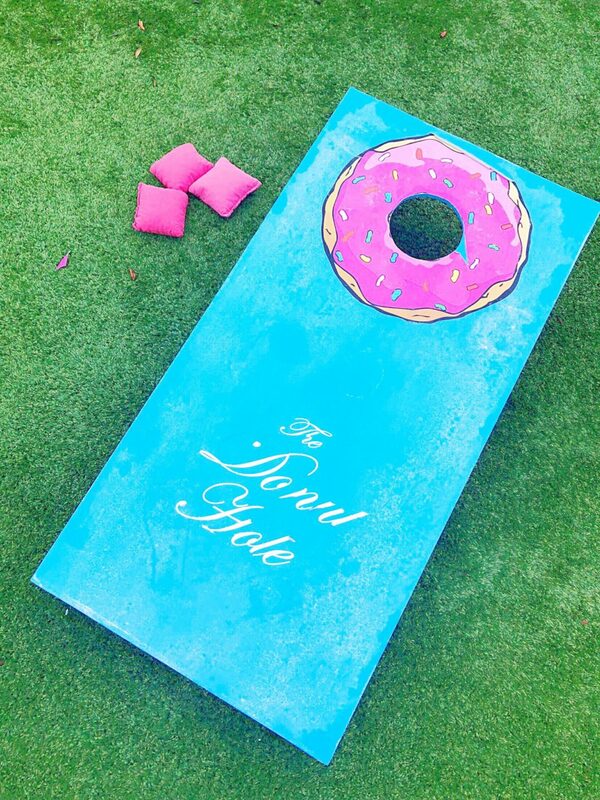 Discover the best 30A donuts here. Hit the Beach Clearly this is the main attraction here on 30A! 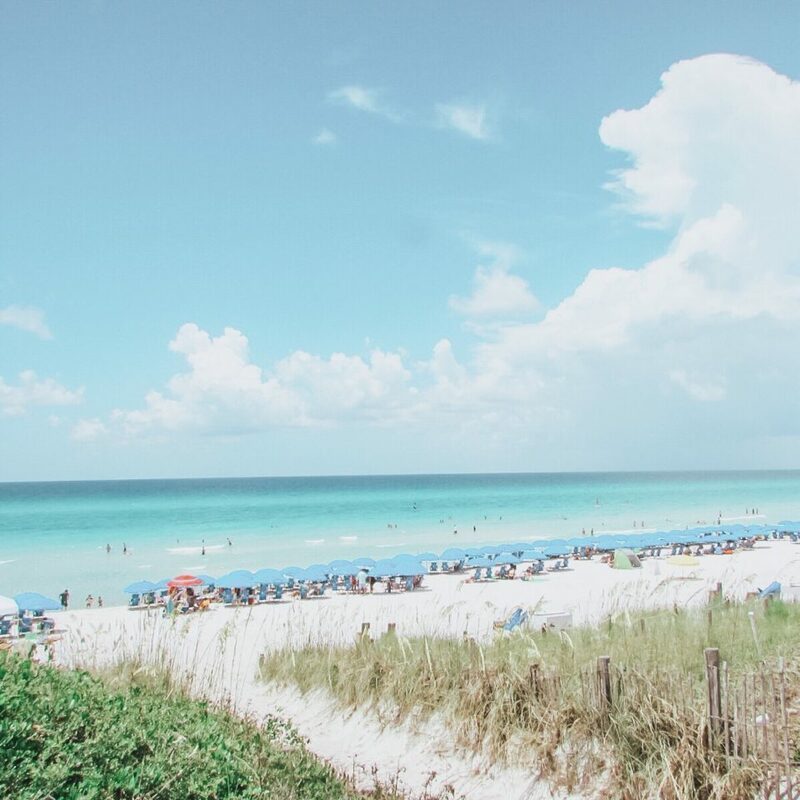 With the softest white sand and clear, turquoise water, our South Walton beaches are really the best you’ll find. 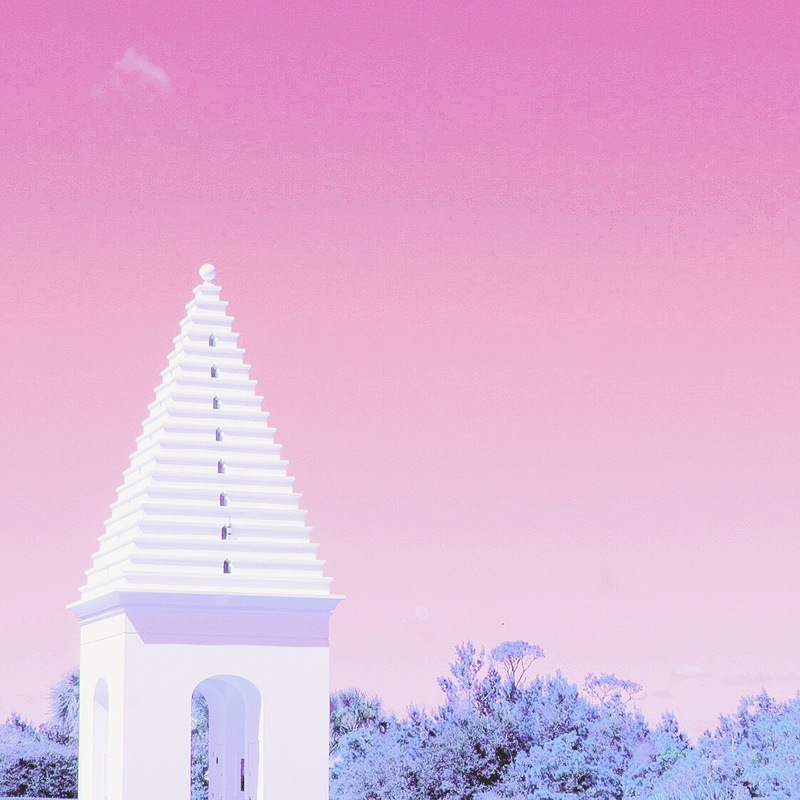 Explore the Neighborhoods. 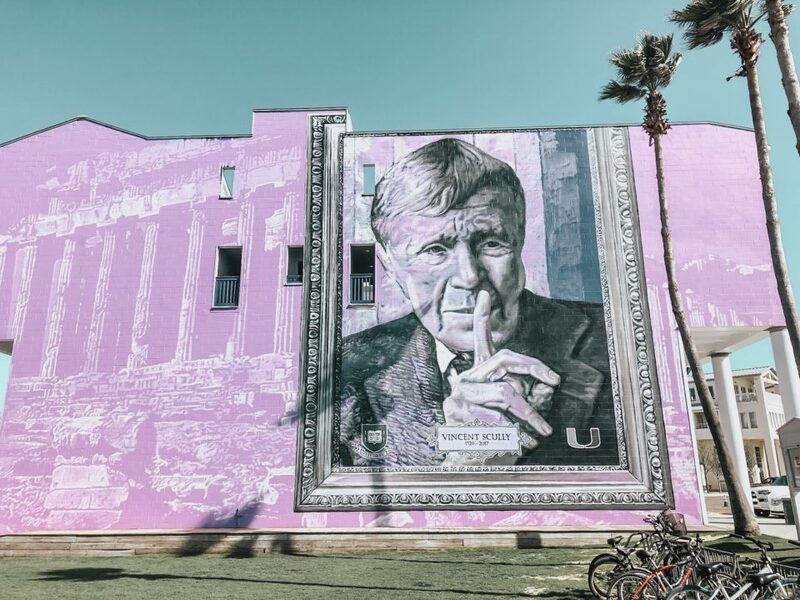 Each neighborhood has its own distinct style, architecture and vibe. 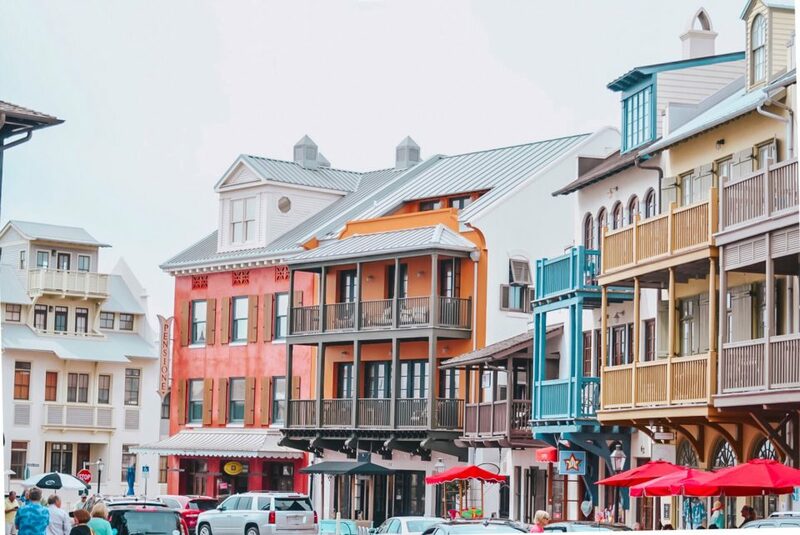 I absolutely love having so many different neighborhoods in one area and always encourage my visiting friends to experience multiple places to understand what makes 30A so special. One “town” is great, but having the variety we have is something you won’t find anywhere else. Enjoy an Event There are so many happenings and while summer is always the busiest, my favorite events happen outside of the peak season. 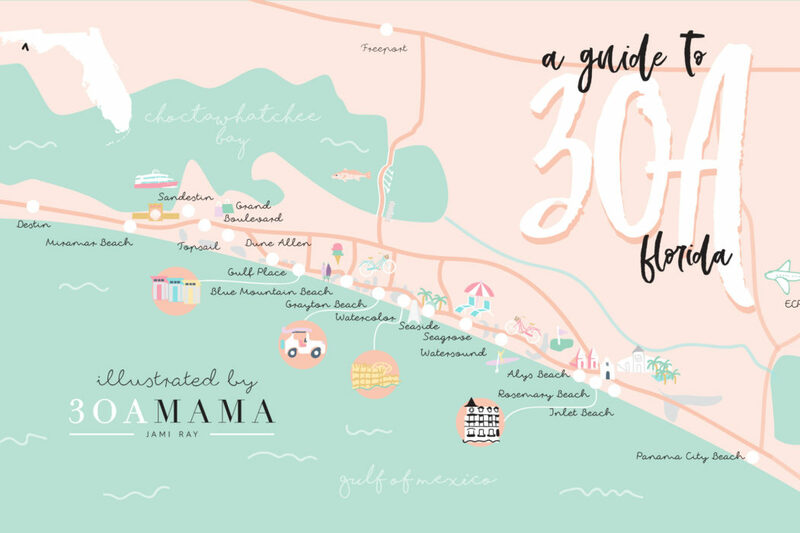 Make plans for 30A Songwriters Festival (January), South Walton Beaches Wine & Food Festival (May), Digital Graffiti (May), Fourth of July celebration (July), Uncorked (October), holiday kick-off festivities (November, Thanksgiving weekend) and Christmas to New Year’s celebrations (December). Go Fishing From gulf fishing to inshore fishing, there is so much fun to be had here. I know a handsome fishing guide if you’re interested! Hunter’s business is Florida Boy Adventures and is perfect for families, guys getaways or even one-person trips. Ride a Bike. With the preferred mode of transportation having only two wheels, if you’re visiting, you can pretty much park your car and bike everywhere. 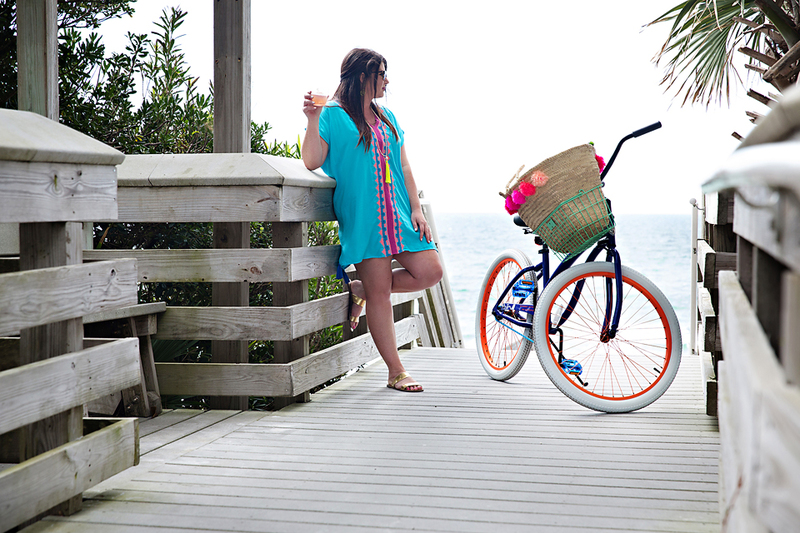 You can explore more, get an up close feel of each neighborhood and have so much fun cruising 30A. Please do not use, repurpose or distribute this map in any way without express permission.